"Short of serving store-bought ice cream, you won't find a simpler, more delicious dessert than this fruit cobbler. Use any juicy summer fruit: peaches, nectarines, blueberries, blackberries, strawberries, raspberries. 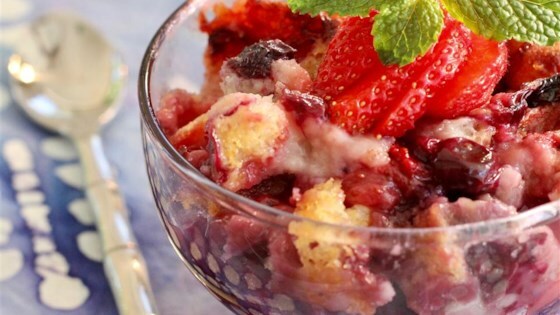 And if you use frozen berries, this dessert can be assembled in less than 10 minutes." Doubled this and made it in a 9x13 with 4 cups of blueberries and about 1/2 c bing cherries. Yum! Added about 1/4 t nutmeg, because we like nutmeg with blueberries.